"Not your father's remote LANC zoom control!" 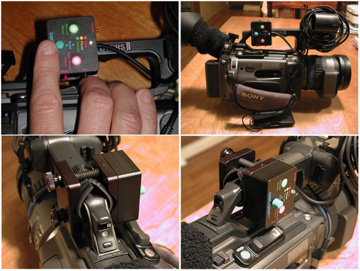 As pictured on the new Sony PD-150 DVCam. My index finger in photo, is 3-3/8" long, measured from inside next to middle finger. I am able to reach and operate the small rubber control knob with my hand through the camera's strap as you normally hold the camera, and it is quite comfortable and natural. You can also set the CoolZoom for the slowest zoom speed, but still quickly push the cameras zoom rocker to zoom in for a focus check at max speed. This "button" is very similar to the ones that were found on early IBM "ThinkPads" and acted as the mouse controller. After some initial problems contacting "Cool Contraptions", the company that makes the CoolZoom I finally heard back via e-mail from Eric, the owner (currently there is no phone number for product support). He is a working cameraman and is not always able to keep up with all his e-mail, though he does make a good effort to get back as soon as possible. This is understandable for a small startup company and for someone working in the freelance marketplace. My message to his technical e-mail address listed on the CoolZoom website as "tech@coolcontraptions.com", concerned my interest in gathering some information regarding customizing the product's "hardwired" LANC cable. "The box is sealed for your protection. Because the box is so small, all the electronics are crammed in. I don't want you to void any warranties by opening. However, if you want to, carefully lift the label and you'll find four screws. They are lock-tite in, so it will be difficult. You can see how the wire is connected. But, if you do this, you will be responsible for repairs. You can very neatly put some quality heat shrink after cutting the wire shorter, and not look bad. This is the preferable way to shorten the cord. or, by putting on one of the plugs you bought, don't use the screw-on back. instead, do a right angle bend with the cord, and epoxy, silicone or hot glue a right angle "housing" on the connector. Good Luck Eric." Therefore, I think I will shorten the cable as Eric suggests. I bought enough connectors from Mouser.com so that I can make up an extra LANC extension cable (male and female plugs using the reminder of the cut cable), this way I can move the CoolZoom to a tripod handle when I need to. The whole idea is not to have all the unneeded cable hanging from the camera when the CoolZoom is mounted on top. These are the stock part numbers you will need to order from "Mouser.com" to do this job. I got two of each as they are cheap. Now the next issue since there was no warranty card included with the product, I wanted to find out what the warranty was. Eric has an agreement with Birns and Sawyer as the distributor of the product to address any CoolZooms that may develop or have problems. I called Birns and Sawyer at 323-466-8211, and spoke with someone named Mike, he was very aware of the product. I told him I bought my unit at B&H Photo in New York and wondered what my options were if I ever had a problem with the product. As always you would first return a product to the place, you bought it, if it was within that stores return period. In the case of B&H Photo, you have 7 days to return a video product for any reason for a full refund, one of the reasons I buy there. After that, you would call Birns and Sawyer if you had a malfunctioning unit. Oddly, there is no actual stated time period for warranty. However, since Birns and Sawyer is an old, well-established business, this could well work in the consumers favor. Since they would much rather have happy customers, Mike told me that in the few rare problem cases so far they simply replaced the CoolZoom with a new one. This is of course assuming the product was not abused. It seems so well made to me I except no problems at all, and I suggest testing it in the store if you can, if it works there you should have no problems in the future with it if you don't mistreat it. Now what do I think of the product? Well, I bought it. B&H Photo has all the different "VariZoom Brand" LANC zoom controls hooked up on display. And they make a fine product also. But I was looking for something other then a tripod handle device. And they do make a pistol grip attachment for the VariZooms as well. The CoolZoom seemed so small that I knew there would be some way to attach it to my Sony PD-150, and I was right! As far as the zooming capabilities, it took a little getting used to the little "joystick" knob. I like it much better then the cameras own zoom rocker. There are adjustable speeds as you can see by the manual card below. 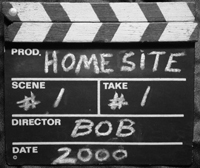 In the film business we rent professional zoom controls like the "MicroForce" that cost over $5,000.00, so I must admit being spoiled. But, since I only paid $350.00, I have to keep that low cost in mind when being critical. It would be nice to include a small dial like one of the VariZoom models has, that would allow you to set any zoom speed you like on a scale of ONE to TEN, and this way you could repeat an exact zoom speed if you had to. Perhaps the LANC software could also be rewritten to make for a "softer" startup and stop zoom, "feathering" if you will. It is not bad now, but could be improved. The only feature or button that did not function on the CoolZoom with the PD-150 was the "Auto/Manual Focus". This is explained in the short manual as something that does not work on some camera models. Doing some more homework I have found from the "experts", that this is true of all the LANC zoom controls on the market when it comes to cameras that have a "Manual Focus Switch", like my PD-150. When you set your camera to it's "manual focus" option you can not use the button on the LANC zoom controllers to override it even temporarily! Frankly, I have heard some "bitching" about this, but personally do not see it as an issue. Most cameras, including mine, have a button on the side for temporarily putting the camera into its "AutoFocus Mode", so you have this feature already, even if it is on the camera body. All the other features of the CoolZoom worked as advertised with my camera. As far as my critiques, I passed on all my thoughts and also suggested to Eric, that some sort of warranty and repair contact information be included with the product. As of this writing 9/26/00, this information is not included with the product I bought off the shelf. Though improvement on all the current crop of LANC zoom controls could be sited. 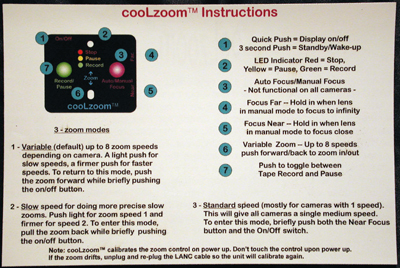 I would strongly recommend purchasing the CoolZoom, as in fact I did! Just remember you really have to try these types of devices out for yourself to see how it feels and reacts for the type of shooting and zooming style you are used to. Do not base a purchase decision on what anyone writes in a magazine or online, try before you buy! All the documentation included with the CoolZoom. For even more info and pictures from a different supplier.